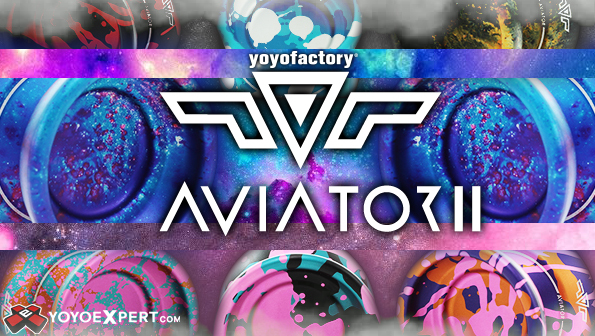 YoYoFactory - Take Your Freestyle to New Heights! The Aviator is back and better than ever! Last year, Luis Enrique Villasenor dominated the International Yo-Yo Open just one week before Worlds, but unfortunately made a few mistakes and didn't make it to the finals. This year, Luis was a top contender for the title and YoYoFactory sent him to Tokyo with a totally re-designed yo-yo! The new Aviator 2! With luis it has always been a matter of matching his speed with the dynamics of the yo-yo. He has such amazing control that he loves a heavy yo-yo, but in freestyle sometimes this holds him back. YoYoFactory needed to design a yo-yo with a heavier feel that could also accelerate when Luis needed it, and that's what they did! The Aviator 2 has the feel and shape that Luis loved from the original Aviator with more stability and speed! Made in the USA, weighted and balanced to Luis' preferences, and fitted with a grind finish and CTX bearing, The Aviator 2 is will elevate any freestyle! Just take a look at Luis' 8th Place WYYC Freestyle and you will see what this yo-yo is capable of!